Owen was fishing in his kayak with his uncle, Shane, just off shore on the east side of the lake near Dakota Beach. He was using leeches and a simple hook with a colored rubber worm. 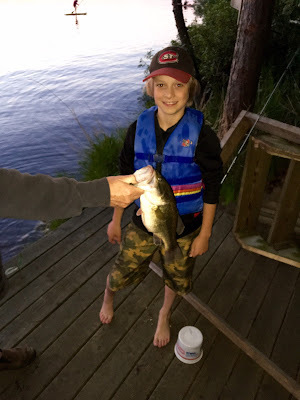 It was just before sunset on May 29th when he caught this bass. Owen loves to fish and to try to reel in the big ones! He especially loves to fish with his dad and try to out fish him.